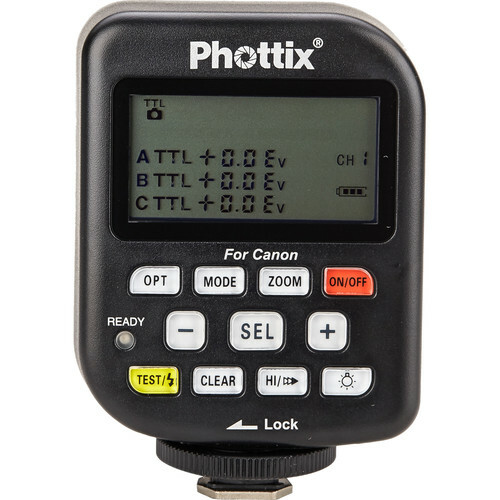 The Odin TCU TTL Flash Trigger Transmitter v1.5 from Phottix is a wireless transmitter that runs on the 2.4 GHz frequency, has four channels with three groups, and can fire your Canon flash from a distance of 328' with separate purchase of a receiver. Flashes within each group have +/- 3 EV power compensation in TTL or user-determined power levels in manual mode. The transmitter can also remotely adjust the angle of the flash beam via its zoom button. The Odin is compatible with Phottix Strato 4-in-1 and Phottix Strato II Multi 5-in-1, and Atlas II wireless systems. Box Dimensions (LxWxH) 8.11 x 4.252 x 2.047"